What Is Jicama Good For? A cup of jicama contains 49 calories. Similar in appearance to a turnip, jicama is actually part of the morning glory family. It produces roots that can weigh up to 50 pounds, according to Michael T. Murray and Joseph E. Pizzorno, authors of "The Encyclopedia of Healing Foods." The root supplies several key nutrients and can be included in a variety of nutritious recipes. A cup of jicama contains 0.78 milligram of iron, which is almost 10 percent of the 8 milligrams men need each day and 4 percent of the 18 milligrams women require daily. Iron promotes energy production and plays a role in the formation of red blood cells. 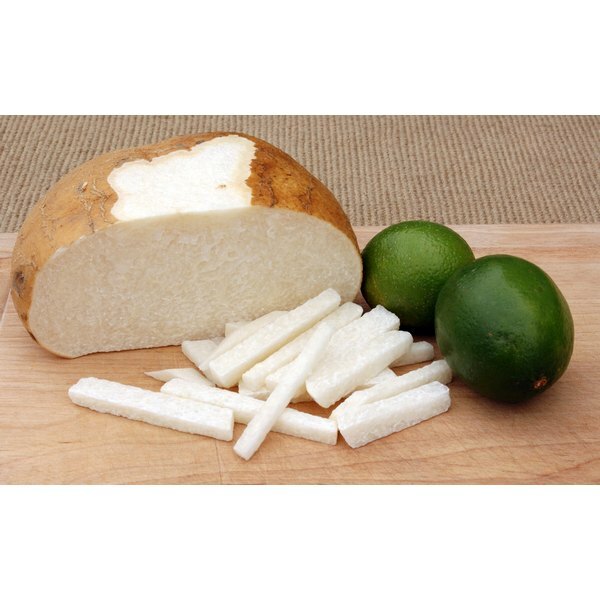 Jicama also contains potassium, a mineral necessary for proper heart and muscle function, and zinc, which aids in wound healing. You'll get 6.4 grams of fiber in a cup of jicama. That translates to about one-fourth of the 25 grams of fiber women need each day and 17 percent of the 38 grams men require daily. Getting adequate amounts of fiber in your diet helps your digestive system work properly and might cut your risk of certain illnesses such as heart disease. Jicama also contains inulin, a type of soluble fiber that can promote gut health, according to a 2009 article published in the "European Journal of Clinical Nutrition." Shred fresh jicama into a tossed green salad or your favorite coleslaw recipe. Add jicama strips to a vegetable platter at a party or other gathering, or serve it as a nutritious side dish to accompany grilled meat. Boil jicama cubes with potatoes, and puree them with milk and herbs as a fiber-rich mashed potato recipe. Or add sliced jicama to au gratin or scalloped potatoes. Add jicama puree to smoothies, or add diced jicama to cooked black beans or guacamole as other ways to eat the food. What Veggies Cause Eyelash Growth?